Most of my posts are about technology involving building websites; the code, the frustrations, the tips. So this strays only slightly; it’s a bit more ‘meta’ – it’s about “living the dream” pitched hard by Tim Ferris, and being productive from “anywhere”. I use a macbook pro as my primary machine, and hook it up to a separate monitor for more screen space. I have an external drive where Time Machine dutifully stores backups, and tells me I’m out of space and it’s going to delete some old stuff (the horror! by the way, Time Machine, can you delete some things from my messy closet?). I set my laptop on a dj stand, and have a huge usb portal that works with about 80% of my devices, which include a full keyboard, a wired mouse, a card reader, and a Wacom tablet. If I disconnect my backup drive without hitting the eject button – which sometimes means turning Time Machine off mid-backup – I get the ‘you killed your drive, you will pay’ message and warning about not properly disconnecting gadgetry before.. well.. disconnecting. What I’m getting at, is that even moving from my desk to my couch* is a major undertaking, involving tangled wires that don’t quite reach and a plethora of cables I have to find the ends to. And that’s just moving to the couch. If I have my backpack with me on the airplane with my computer tucked inside, that process is only exacerbated by ‘omg did I remember my power cable’ (one time I did not, $40 later I got one made in China at a combination electronics and used sporting goods score on the coast of Oregon. True story). I’m thinking this is wonderful, I can really work from anywhere as long as I have wifi. Which is true. In a sense. But the problem is, do I want to? 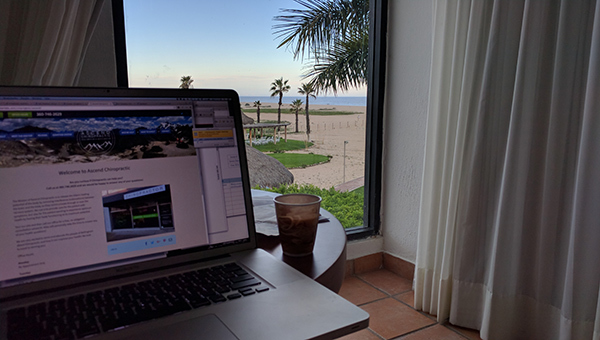 The first time this conundrum really hit home was sitting in my hotel room, which had a view of the ocean past a lagoon from the tiny round table from where I set up my work station. Here I was in a semi-tropical local, a place I frequent but once every few years. I’m at my home or office almost every day. Do I really want to spend my time in this place that has taken time, effort and money to get to and be at, a place that is about 180 degrees from my home town in climate and culture, staring at a screen full of code? If I’m going to be working, why leave home? And if I’m visiting friends or family in a place that has also taken me far from home, do I want to maximize my time with them, or get work done? I’ve read some of Mr. Ferris’s work. If you indeed are only working four hours a week, then you can get by with your phone if your travel is for less than a week. But his perspective is perhaps from not having a home base, where you ‘get away now and then’ to experience something new. I don’t think he talks about this ‘missing out of where you’re being’ aspect of ‘working from anywhere’ because your face is buried in a computer instead of sharing beers and tacos with your peeps in a foreign country. What is your experience with work and travel? *I’m supposed to keep my foot elevated after a medical procedure. Hard to do at a desk.